The distinction between real and play seems clear, but at closer inspection the concept of play reveals itself to be a complex one. “a free act, that is consciously ‘not meant’ and outside of normal life, that still might completely absorb the player, to which no direct material interest is connected, or use is gained, that unfolds itself in a purposely set up limited time and space, which adheres to certain rules and order, and brings forth a sense of community, which gladly shrouds itself in secrets or is distinguished from the real world by use of disguise. “(translated from p. 41, Huizinga, 1938). Caillios (1957) defines play as an activity that is essentially free, separate, uncertain, unproductive, governed and make-believe. Meaning that we cannot be forced into play; it is something we undertake by our own choice. If we would be forced, the experience would cease to be play and become an assignment. Furthermore, play is separated from normal day-to-day living. Often this separation is physical; one chalks lines on the ground for hop-scotch to physically limit the playing field or plays a board game on a board and only on this board does the game exist. Play is also separated in time: there is a start and a stop to the playing. Play also requires some level of uncertainty; will it work, will it be fun, will the audience laugh and of course who will win? If the outcome of the undertaking was certain play would turn into a task. 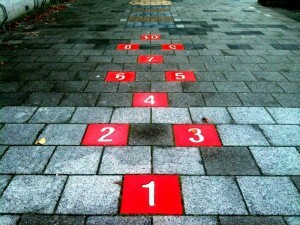 It would be no more than a series of steps to achieve an outcome. The achievement of an outcome must also be absent; the product of play can only be play itself, otherwise it becomes merely a means to an end. To control all the things play must or must not be, play requires rules. Finally, play can never be real. and a domain to which one must enter voluntarily. ilinx, the disruption of our normal state or being in search of vertigo (Roller-coaster ride). The different types of play offer different dynamics to the player; during alea the player is passive and content to let ‘the fates decide’. During mimicry the player must actively ‘play his part’ or the illusion is lost. Often the categories merge in a single game, yet one always remains dominant. For example; most card games are a mixture between the wits of agôn and the luck of alea but in playing poker agôn is more dominant. ludus describes a state of overly conventions. Between paida en ludus the level of fantasy versus rules can be described. Both states have no function in the absolute; both pure uncontrolled fantasy and conventions for everything would no longer be play. These four categories and two dimensions are very useful to create some sort of order in the numerous kinds of play. In each instance of play one of the four categories will be dominant and it can be placed along the sliding scale of freedom versus rules. This categorisation allows for a comparison between various kinds of play. This entry was posted in Mediated and tagged Game, Philosophy, play, Science, Wetenschap. Bookmark the permalink.